Orlando, Florida. The most magical place in the world. You’ve spent the past few days wading through manmade lazy rivers, watching animatronic pirates battle it out on the fake high seas, and got the epic group photo on the roller coaster of death. So now you really need a vacation! We’ve got a different kind of ride for you. The old school one – you know, that horse and buggy stuff? 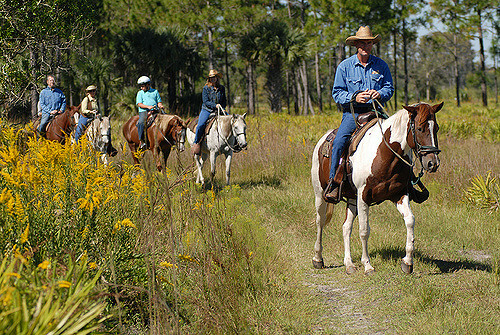 Except this time you can actually be on a horseback safari…in Orlando. In Orlando (yes, we said it again). If you’re thinking “I’ve never ridden a horse in my life,” no problemo. Forever Florida will find you your horse soulmate so you can explore the 4,700 acre expanse at your own pace, whether that’s breakneck speed or on island time. The best part? You can camp overnight and stay up looking for the elusive Florida panther in these unspoiled ecosystems. Plus, you’ll actually feel good about all the money you’re spending: 30% of all safari profits are donated to the conservation effort to protect Florida’s unique wilderness. So give those alligators and black bears a warm wave. Just don’t expect them to be playing the banjo for you.